It may seem a bold claim that animals have some kind of essential, even ontological, relationship to human culture, but a mere glance at online spaces confirms it. With cat videos, dog videos, critter cams, and the endlessly proliferating GIFs and memes, the Internet is clogged with animal media. Whether this media cutely anthropomorphizes, makes them uncannily alien or achingly empathetic, the sheer volume suggests the intensification of attention around humanity’s fellow fauna—an intensification that coincides, ironically and tragically, with rapidly accelerating rates of extinction in the animal kingdom. Animals have always reflected our own qualities back on us, both by mimesis and by contrast. Now, it seems, the representation of animals functions more frequently as a means of indexing those characteristics that humans have lost or failed to achieve: namely, their humanity. Bettina Perut and Iván Osnovikoff’s Los Reyes follows Chola and Football, a pair of stray dogs who reside in the oldest skate park in Santiago, Chile. The documentary is more substantial (and dialectical) than a Facebook dog-spotting video. But it dabbles in the same paradoxes of humanity’s peculiar relationship with animals that most animal media share—all while resisting the temptation to humanize its subjects’ essential caninity or smooth out the rough edges of their existence. That existential roughness, rather than the expected furry softness, is one of the film’s primary textures. Shooting their dog protagonists in often exquisitely intimate close-ups of grizzled maws, fleshy gums, and weathered paw pads, the filmmakers foreground their curious status as semi-wild beasts that subsist both in the middle and at the margins of human society. The presumably elder Football, perpetually shaggy and bleary-eyed, is frequently seen lounging with an object in his mouth—a ball, a discarded bottle, an empty cigarette pack, even a rock—clenched in his blunted jaws. The sprightlier Chola is rather more engaged, barking at passing bikers, mules, and—sensing trouble—police-horses, or taking part in an invented game in which she dangles a ball at the edge of one of the skate park’s bowls, catching it at the precise moment it begins to teeter out of reach. Aside from these distractions— and the very occasional pat or ball-toss from a friendly passerby—all they really have is each other. What is this companionship, exactly? The film mostly resists projecting human sociality onto the dogs, but the whole enterprise of making animals into characters makes the potential for anthropomorphism difficult to avoid. Their relationship is apparently one of friendship; they are not “married.” Each engages in a quick carnal liaison—Football humps a passing dog; Chola grinds on a pillow she’s found somewhere —but otherwise there is not much love to be found in the skate park. They are exposed to the elements and the park’s porous public space, constantly surrounded by people and animals, but they are mostly alone, together. Framed by the camera as they languidly lie together, gazing at one another, aware of each other, they enact a companionship of comfortable proximity. But it is also a companionship solidified by precarity: for although the dogs are, as the film’s title implies, the skate park’s unofficial monarchy, they are at other times guests in their own home—as when some kind of gaudy, corporate-sponsored skateboarding event seems to threaten to displace them. It’s tempting, then, to see in the figure of the stray—the de-domesticated animal—a kind of symbolic archetype of contemporary life. Chola and Football have a home (the park) and even individual homes (do-gooders construct doghouses for them), but are nevertheless homeless. The park belongs to them, but as it in fact belongs to human society, even if it is usually the haunt of human society’s least valued members. 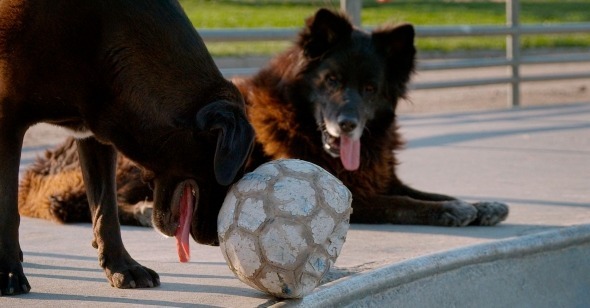 As if to emphasize the dogs’ affinity with their human counterparts, the soundtrack frequently features excerpted conversations between the local teens who use the park. Against images of the dogs sleeping, looking, playing, investigating, we hear a babble of stoner jokes, complaints about parents and corrupt cops, disses, drug talk, tattoo show-and-tell, cries of teen angst and economic despair. Though we never see the teenagers, their dialogues lend to the images of Chola and Football a sense of counterpoint, an echo of the human world that intersects only occasionally or unconsciously with a canine one. But they also build a subtle concordance: Survival, after all, is the shared lot of dog and teenager alike, and the film makes their atomized daily fighting for subsistence, space, even pleasure in the increasingly segmented and stratified environment of the city into a shared struggle, the lot of the marginalized. Los Reyes plays February 9 at Film Society of Lincoln Center as part of Film Comment Selects.